Most memorable magic involves a great deal of hiding. Disney, an empire that perfected creating magic for kids (and families, too), does a superb job of hiding. Disney World is an expertly constructed escape from normal life. It’s immersive – the outside world remains hidden. It’s filled with all of your favorite characters – their real identities are hidden (you’d never spot a headless Mickey). Now, it comes complete with a wristband that does everything from giving you keyless access to your room to unlocking surprises tailored specifically to you – a seamless experience, hidden in technology. The Disney MagicBand is a portable hub that stores every choice you make in advance with My Disney Experience (an online comprehensive planner). Once the MagicBand syncs with your choices, it opens all the doors to the full force of magic within Disney World’s borders. As an overhaul of the digital infrastructure of a resort gigantic enough to bear the name ‘World,’ bold might be understating it. What if guests didn’t take to the changes? Are there privacy concerns? Does the experience design live up to its hype? We sent our CEO Jake Hamann to Disney World to see for a firsthand account of the future of Disney magic. "The Magic Band provides a really seamless user experience from weeks before the trip to the time you leave the resort," Hamann said, "Integration between the MagicBand and the Disney Experience App was top notch." Disney’s MagicBand uses proximity technology to make magic across the resort. It’s a glimpse into the future of both wearables and proximity tech. It’s also an eyeful of the future of Big Data. While guests are being wooed with surprises and an easier, hassle-free park experience, Disney is collecting valuable data. That data can be used to make changes or improvements to rides, foods, attractions and more. For Disney, the magic lies in knowing its guests better and making sure they’ll come back for more. When implementing technology this expansive, one of the most important aspects that can make it succeed or fail is: does it work? "Two factor authentication with the band and fingerprint at the park entrances was surprisingly accurate," Hamann said. Not only does it work, but Disney's MagicBand can create experiences that impress even those in the know: "Integration between the rides and pictures afterwards was truly magical – still unsure how they matched up." It's a pioneering example of the magic that wearable tech and proximity tech can make in a business. 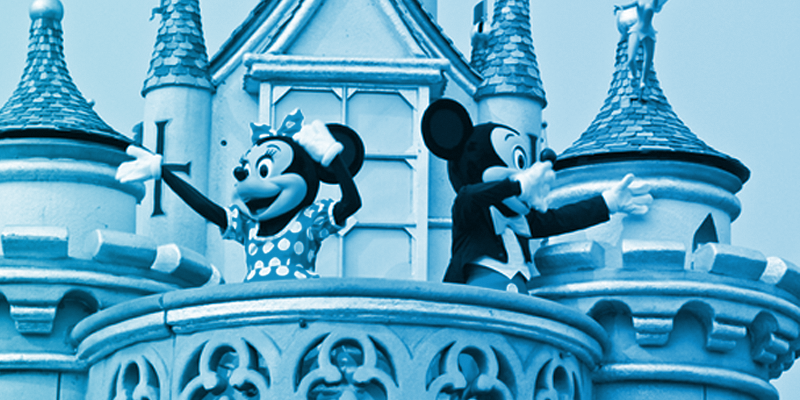 With Disney leading the charge, look for other businesses to follow suit and apply these available technologies to craft bold new experiences both internally and for customers. Hamann sees the MagicBand as a major plus for Disney and a concept that bears replicating. "Entry to the parks and access to the FastPass rides was easy and much easier than a traditional ticket experience," Hamann said, "The kids always made it a race to see who could get to our resort room the quickest to use the MagicBand to unlock the door." Wearables, proximity tech, and analytics are all hiding in plain sight in Disney’s vision for the future of magic – disguised in nothing other than an iconic pair of Mouse ears. Another boon for Disney? "It’s such a convenience that you quickly forget how much money you’re spending!"